The full feature can be found on page 82 in the online version of the magazine. 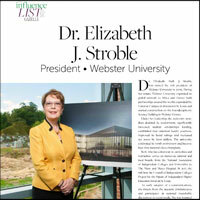 Webster University President Elizabeth (Beth) J. Stroble was named one of the most influential people in St. Louis by Gazelle STL magazine. The latest issue of the magazine is online the print version is distributed throughout the St. Louis region. The article discussed how since Stroble's arrival in 2009, the University has expanded its global network to Africa and Greece and built global partnerships around the world, as well as having "more than doubled its endowment, significantly increased student scholarships funding, established four endowed faculty positions, improved its bond ratings and increased net assets by $100 million."